Culturlann Arts Centre [216 Falls Road] is three floors celebrating Irish cultural traditions through art, exhibitions and music. Be prepared to hear Irish spoken and take the opportunity to learn how the language developed. Great place to buy souvenirs, books and CDs. Breakfast in the cafe, where the menu is in Irish (and, fortunately, English) to sample some genuine Irish fare. While ‘The Troubles’ are now in the past, their legacy remains. Take a Black Taxi ‘Living History Tour’ [Phone 0800 052 3914 for booking] along the Falls and Shankill Roads to glean some local, and historical, knowledge of how things were. View the famous sectarian murals and visit the ramparts of former ‘peace lines’ – bulwarks higher and longer than the Berlin Wall - which formerly kept the warring sections apart. 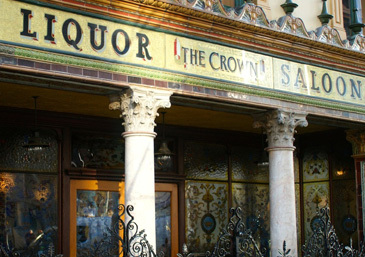 Luxuriate in the splendour of The Crown [46 Victoria Street] - the finest Victorian gin palace in Britain. Carefully restored, it boasts scalloped gaslights, gleaming brass work, and wood panelled snugs bearing a passing resemblance to confessional boxes. Ignore your cardiologist’s advice and order a plate of Strangford oysters and champ (creamed mashed spuds, butter and spring onions). Belfast women are reputedly the best dressed in Europe. Peruse the city’s fashion emporia at the Victoria Square Centre [1 Victoria Square]. Load up with designer-label clothes, shoes and accessories from such as Dune, Hilfiger, House of Frazer and Guess. There are fifty flagship outlets on offer. Rest and revive with a swift coffee at Costa before leaving. Nicknamed ‘The Iceberg’, Titanic Belfast [Queen’s Road, Titanic Quarter] is a £100 million, iconic, metal sharded, edifice that has become the city’s new landmark. Embark on a sensory, interactive, experience of the great liner’s journey from conception and construction in Belfast, to its final Atlantic resting place. At his Cayenne Restaurant [7 Ascot House, Shaftesbury Square] TV celebrity chef, Paul Rankin, presents simple food, simply prepared, but each dish offers a little something unexpected. Only the best of local produce is served. Sample the succulent Lough Erne lamb rump roast followed by delicious apple and blackberry crumble, topped with Rankin’s signature home made buttermilk ice cream. Spend the evening at Maddens Bar [74 Smithfield]. for great craic with the locals who will joyously bid you ‘cead mile failte’ (hundred thousand welcomes). This relaxed, friendly pub is renowned for its traditional Irish music. Don’t miss the opportunity to join in the ceilidhing (Irish dancing) and whirl the night away. Creamy pints of the best Guinness on-tap to keep your feet a-tapping. Dubbed ‘Hotel of the Year’ in 2012, and still one of the hippest places to stay, the city centre Merchant Hotel [35-39 Waring Street] is located in the former headquarters of the Ulster Bank. Before retiring to your art-deco room, visit the Jazz Bar where the staff take pride in their award winning cocktails. Encourage complete relaxation with a dip in the hot tub on the top floor while enjoying stunning views of the illuminated city.